The Egyptian belief that "To speak the name of the dead is to make him live again" is certainly carried out in the building of the tombs. The king's formal names and titles are inscribed in his tomb along with his images and statues. 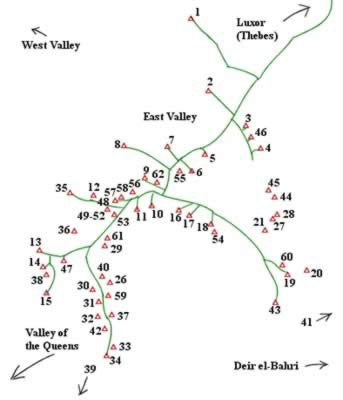 Beginning with the 18th Dynasty and ending with the 20th, the kings abandoned the Memphis area and built their tombs in Thebes. Also abandoned were the pyramid style tombs. Most of the tombs were cut into the limestone following a similar pattern: three corridors, an antechamber and a sunken sarcophagus chamber. These catacombs were harder to rob and were more easily concealed. Construction usually lasted six years, beginning with the new reign. 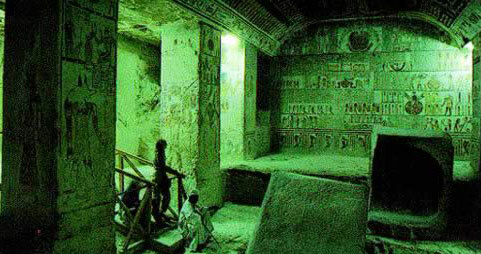 The text in the tombs are from the Book of the Dead, the Book of the Gates and the Book of the Underworld. 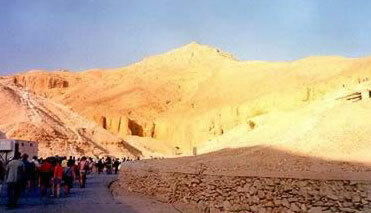 See also a history and overview of the Valley of the Kings. Three white corridors descend to the sarcophagus chamber in this tomb. The chambers ceilings depict the goddess Nut. The lid of the pink granite sarcophagus is decorated with Isis and Nephthys, which were meant to serve as guardians over the body. Their duties fell short, however, as the tomb was robbed in ancient times. Originally the priests placed the sarcophagus in Amenhotep II's tomb in order to hide the body, which was a common practice. Two sets of steps lead down to the tomb door that is decorated with the Pharaoh worshipping the solar disc. Isis and Nephthys stand behind him on either side. Three corridors lead into an antechamber that opens into a pillared hall. The passage beyond that leads to the sarcophagus chamber. The steep descent into the tombis typical of the designs of the XIX Dynasty. 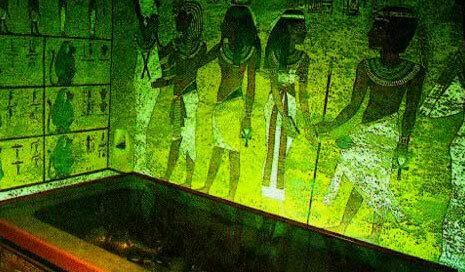 The entrance is decorated with Isis and Nephthys worshiping the solar disc. Text from the Book of the Gates line the corridors. The outer granite lid of the sarcophagus is located in the antechamber, while the lid of the inner sarcophagus is located down more steps in the pillared hall. 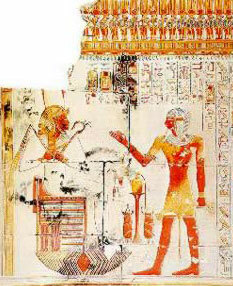 Carved on the pink granite lid is the figure of Merneptah as Osiris. Originally built for Ramesses V this tomb has three chambers and a 4th pillared chamber was added by Ramesses VI. Complete texts of the Book of the Gates, the Book of Caverns and the Book of Day and Night line the chambers. Portions of the Book of the Dead are located in the pillared chamber, along with scenes of the sky goddess, Nut. The tomb is sometimes referred to as the "Harpers Tomb" due to the two harpers playing to the gods in four of the chambers. Ten small chambers branch off of the main corridors. These were for the placement of tomb furniture. The longest tomb in the valley, 100m, contains very well preserved reliefs in all of its eleven chambers and side rooms. One of the back chambers is decorated with the Ritual of the Opening of the Mouth, which stated that the mummy's eating and drinking organs were properly functioning. Believing in the need for these functions in the afterlife, this was a very important ritual. The sarcophagus is now in the Sir John Soane Museum, London. The approach to this unusual tomb is an ascent up wooden steps, crossing over a pit, and then a steep descent down into the tomb. 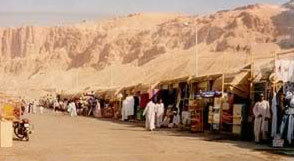 The pit was probably dug as a deterrent to tomb robbers. Two small chambers, decorated with stars, and a larger vestibule are in front of the sarcophagus chamber, which is uniquely rounded and decorated with only red and black. In this Tomb, a steep flight of stairs and a long unadorned corridor lead to the sarcophagus chamber. Three mummies, Tuthmosis IV, Amenhotep II III and Seti II, were found in one side room and nine mummies were found in another. This tomb's construction is identical to that of Seti I's with the exception of some of the inner decorations. 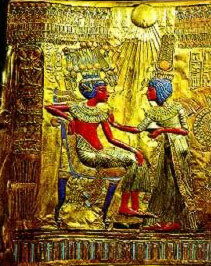 Though small and unimpressive, Tutankhamun's Tomb is probably the most famous, due to its late discovery. Howard Carter's description upon opening the tomb in 1922 was, "At first I could see nothing, the hot air escaping from the chamber causing the candle flames to flicker, but presently, as my eyes grew accustomed to the light, details of the room within emerged slowly from the mist, strange animals, statues and gold - everywhere the glint of gold. 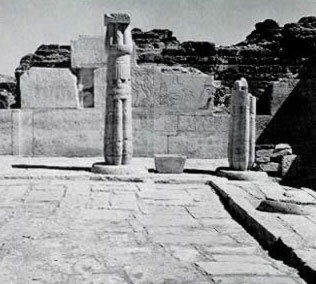 For the moment - an eternity it must have seemed to the others standing by - I was dumb with amazement, and when Lord Carnarvon, unable to stand the suspense any longer, inquired anxiously, 'Can you see anything?' it was all I could do to get out the words, "Yes, wonderful things."' The royal seal on the door was found intact. The first three chambers were unadorned, with evidence of early entrance through one of the outside walls. The next chamber contained most of the funerary objects. The sarcophagus was four guilded wooden shrines, one inside the other, within which lay the stone sarcophagus, three mummiform coffins, the inner one being solid gold, and then the mummy. Haste can be seen in the reliefs and the sarcophagus, due to the fact that Tutankhamun died at only 19 years of age following a brief reign. Though extremely impressive to the modern world, the treasures of Tutankhamun must have paled when compared to the tombs of the great Pharaohs that ruled for many years during Egypt's golden age. See Also the Tutankhamun Collection.